The original World Trade Center in March 2001. 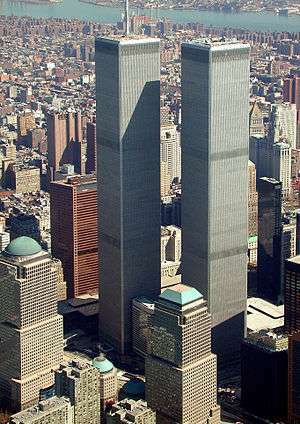 The tower on the left, with antenna spire, was 1 WTC. The tower on the right was 2 WTC. 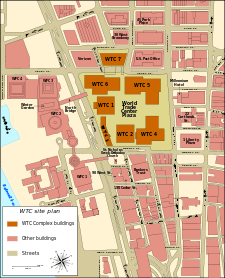 All seven buildings of the WTC complex are partially visible; refer to map below. The red granite-clad building left of the Twin Towers was the original 7 World Trade Center. In the background is the East River. The World Trade Center experienced a fire on February 13, 1975, a bombing on February 26, 1993, and a robbery on January 14, 1998. In 1998, the Port Authority decided to privatize the World Trade Center, leasing the buildings to a private company to manage, and awarded the lease to Silverstein Properties in July 2001. On the morning of September 11, 2001, Al-Qaeda-affiliated hijackers flew two Boeing 767 jets into the complex, beginning with the North Tower at 8:46 a.m., then the South Tower at 9:03 a.m., in a coordinated act of terrorism. 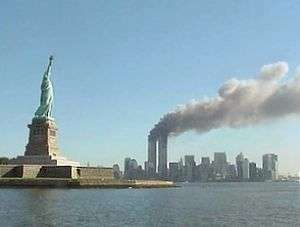 After burning for 56 minutes, the South Tower collapsed at 9:59 a.m. 29 minutes later, at 10:28 a.m. (102 minutes after being struck by the plane), the North Tower collapsed. The attacks on the World Trade Center killed 2,606 people in and within the vicinity of the towers, as well as all 157 on board the two aircraft. Falling debris from the towers, combined with fires that the debris initiated in several surrounding buildings, led to the partial or complete collapse of all the other buildings in the complex and caused catastrophic damage to ten other large structures in the surrounding area, including the World Financial Center and Deutsche Bank Building; three buildings in the World Trade Center complex collapsed due to fire-induced structural failure, and when the North Tower collapsed, debris fell on the nearby 7 WTC, damaging it and starting fires that eventually led to its collapse. The cleanup and recovery process at the World Trade Center site took eight months. Plans for the use of eminent domain to remove the shops in Radio Row bounded by Vesey, Church, Liberty, and West Streets began in 1961 when the Port Authority of New York and New Jersey was deciding to build the world's first world trade center. They had two choices: the east side of Lower Manhattan, near the South Street Seaport; and the west side, near the H&M station, Hudson Terminal. (p56) Initial plans, made public in 1961, identified a site along the East River for the World Trade Center. As a bi-state agency, the Port Authority required approval for new projects from the governors of both New York and New Jersey. New Jersey Governor Robert B. Meyner objected to New York getting a $335 million project. Toward the end of 1961, negotiations with outgoing New Jersey Governor Meyner reached a stalemate. At the time, ridership on New Jersey's Hudson and Manhattan Railroad (H&M) had declined substantially from a high of 113 million riders in 1927 to 26 million in 1958 after new automobile tunnels and bridges had opened across the Hudson River. In a December 1961 meeting between Port Authority director Austin J. Tobin and newly elected New Jersey Governor Richard J. Hughes, the Port Authority offered to take over the Hudson & Manhattan Railroad to have it become the Port Authority Trans-Hudson (PATH). The Port Authority also decided to move the World Trade Center project to the Hudson Terminal building site on the west side of Lower Manhattan, a more convenient location for New Jersey commuters arriving via PATH. With the new location and Port Authority acquisition of the H&M Railroad, New Jersey agreed to support the World Trade Center project. In compensation for Radio Row business owners' displacement, the PANYNJ gave each business $3,000 each, without regard to how long the business had been there or how prosperous the business was. (p68) After the area had been purchased for the World Trade Center in March 1964, Radio Row was demolished starting in March 1965. It was completely demolished by 1966. A typical floor layout and elevator arrangement of the WTC towers. Yamasaki's design for the World Trade Center, unveiled to the public on January 18, 1964, called for a square plan approximately 208 feet (63 m) in dimension on each side. The buildings were designed with narrow office windows 18 inches (46 cm) wide, which reflected Yamasaki's fear of heights as well as his desire to make building occupants feel secure. 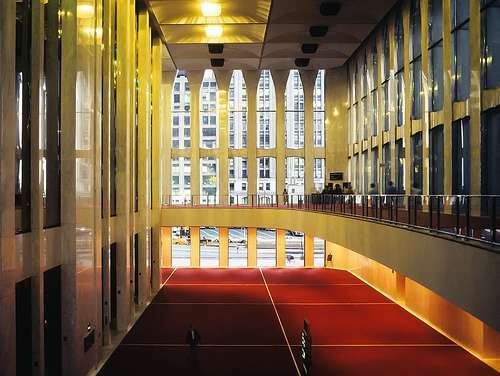 Yamasaki's design included building facades sheathed in aluminum-alloy. The World Trade Center was one of the most-striking American implementations of the architectural ethic of Le Corbusier, and it was the seminal expression of Yamasaki's gothic modernist tendencies. A major limiting factor in building height is the issue of elevators; the taller the building, the more elevators are needed to service the building, requiring more space-consuming elevator banks. Yamasaki and the engineers decided to use a new system with two "sky lobbies"—floors where people could switch from a large-capacity express elevator to a local elevator that goes to each floor in a section. 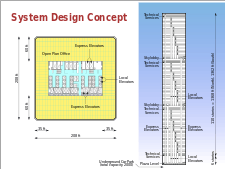 This system, inspired by the local-express train operation that the New York City Subway system used, allowed the design to stack local elevators within the same elevator shaft. Located on the 44th and 78th floors of each tower, the sky lobbies enabled the elevators to be used efficiently, increasing the amount of usable space on each floor from 62 to 75 percent by reducing the number of elevator shafts. Altogether, the World Trade Center had 95 express and local elevators. The structural engineering firm Worthington, Skilling, Helle & Jackson worked to implement Yamasaki's design, developing the tube-frame structural system used in the twin towers. The Port Authority's Engineering Department served as foundation engineers, Joseph R. Loring & Associates as electrical engineers, and Jaros, Baum & Bolles as mechanical engineers. Tishman Realty & Construction Company was the general contractor on the World Trade Center project. Guy F. Tozzoli, director of the World Trade Department at the Port Authority, and Rino M. Monti, the Port Authority's Chief Engineer, oversaw the project. As an interstate agency, the Port Authority was not subject to local laws and regulations of the City of New York, including building codes. Nonetheless, the structural engineers of the World Trade Center ended up following draft versions of the new 1968 building codes. In January 1967, the Port Authority awarded $74 million in contracts to various steel suppliers, and Karl Koch was hired to erect the steel. Tishman Realty & Construction was hired in February 1967 to oversee construction of the project. Construction work began on the North Tower in August 1968; construction on the South Tower was underway by January 1969. The original Hudson Tubes, carrying PATH trains into Hudson Terminal, remained in service as elevated tunnels during the construction process until 1971 when a new PATH station opened. 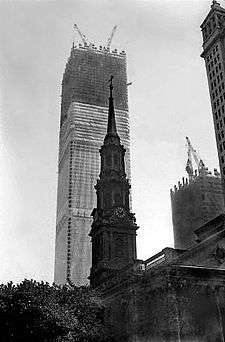 The topping out ceremony of 1 WTC (North Tower) took place on December 23, 1970, while 2 WTC's ceremony (South Tower) occurred later on July 19, 1971. The first tenants moved into the North Tower on December 15, 1970; the South Tower accepted tenants in January 1972. When the World Trade Center twin towers were completed, the total costs to the Port Authority had reached $900 million. The ribbon cutting ceremony was on April 4, 1973. Plans to build the World Trade Center were controversial. The site for the World Trade Center was the location of Radio Row, home to hundreds of commercial and industrial tenants, property owners, small businesses, and approximately 100 residents, many of whom fiercely resisted forced relocation. A group of small businesses affected filed an injunction challenging the Port Authority's power of eminent domain. The case made its way through the court system to the United States Supreme Court; the Court refused to accept the case. Private real estate developers and members of the Real Estate Board of New York, led by Empire State Building owner Lawrence A. Wien, expressed concerns about this much "subsidized" office space going on the open market, competing with the private sector when there was already a glut of vacancies. The World Trade Center itself was not rented out completely until after 1979 and then only due to the fact that the complex's subsidy by the Port Authority made rents charged for its office space relatively cheaper than that of comparable office space in other buildings. Others questioned whether the Port Authority should have taken on a project described by some as a "mistaken social priority". For many years, the immense Austin J. Tobin Plaza was often beset by brisk winds at ground level owing to the Venturi effect between the two towers. In fact, some gusts were so high that pedestrian travel had to be aided by ropes. In 1999, the outdoor plaza reopened after undergoing $12 million renovations, which involved replacing marble pavers with gray and pink granite stones, adding new benches, planters, new restaurants, food kiosks and outdoor dining areas. Lobby of Tower 1, looking south along the east side of the building, August 19, 2000. When completed in 1972, 1 World Trade Center became the tallest building in the world for two years, surpassing the Empire State Building after a 40-year reign. The North Tower stood 1,368 feet (417 m) tall and featured a telecommunications antenna or mast that was added at the top of the roof in 1978 and stood 362 feet (110 m) tall. With the 362-foot (110 m)-tall antenna/mast, the highest point of the North Tower reached 1,730 feet (530 m). Chicago's Sears Tower, finished in May 1973, reached 1,450 feet (440 m) at the rooftop. Throughout their existence, the WTC towers had more floors (at 110) than any other building. This number was not surpassed until the advent of the Burj Khalifa, which opened in 2010. Two World Trade Center's observation deck attracted enormous numbers of visitors. The Midtown Manhattan skyline can be seen in the distance. 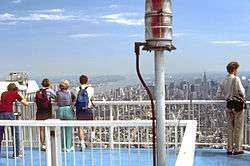 Although most of the space in the World Trade Center complex was off-limits to the public, the South Tower featured an indoor and outdoor public observation area called Top of the World Trade Center Observatories on its 107th and 110th floors. Visitors would pass through security checks added after the 1993 World Trade Center bombing, then were sent to the 107th floor indoor observatory at a height of 1,310 feet (400 m). The columns on each face of the building were narrowed on this level to allow 28 inches of glass between them. The Port Authority renovated the observatory in 1995, then leased it to Ogden Entertainment to operate. Attractions added to the observation deck included a simulated helicopter ride around the city. The 107th floor food court was designed with a subway car theme and featured Sbarro and Nathan's Famous Hot Dogs. Weather permitting, visitors could take two short escalator rides up from the 107th floor viewing area to an outdoor viewing platform on the 110th floor at a height of 1,377 ft (420 m). On a clear day, visitors could see up to 50 miles (80 km). An anti-suicide fence was placed on the roof itself, with the viewing platform set back and elevated above it, requiring only an ordinary railing and leaving the view unobstructed, unlike the observation deck of the Empire State Building. The North Tower had a restaurant on its 106th and 107th floors called Windows on the World, which opened in April 1976. The restaurant was developed by Joe Baum at a cost of more than $17 million. Aside from the main restaurant, two offshoots were located at the top of the North Tower: "Hors d'Oeuvrerie" (offered a Danish smorgasbord during the day and sushi in the evening) and "Cellar in the Sky" (a small wine bar). Windows on the World also had a wine school program run by Kevin Zraly. Windows on the World was closed following the 1993 World Trade Center bombing. Upon reopening in 1996, Hors d'Oeuvrerie and Cellar in the Sky were replaced with the "Greatest Bar on Earth" and "Wild Blue". In 2000, its last full year of operation, Windows on the World reported revenues of $37 million, making it the highest-grossing restaurant in the United States. 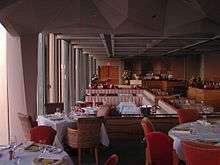 The Skydive Restaurant, opened in 1976 on the 44th floor of the North Tower, was also operated by Windows on the World restaurant, but served only lunch. 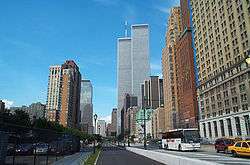 The World Trade Center from the then newly completed West Side Highway in July 2001. Five smaller buildings stood around the 16 acres (65,000 m2) block. One was the 22-floor hotel, which opened in 1981 as the Vista Hotel, and in 1995 became the Marriott World Trade Center (3 WTC) at the southwest corner of the site. Three low-rise buildings (4 WTC, 5 WTC, and 6 WTC) in the same hollow tube design as the towers also stood around the plaza. 6 World Trade Center, at the northwest corner, housed the United States Customs Service and the U.S. Commodities Exchange. 5 World Trade Center was located at the northeast corner above the PATH station and 4 World Trade Center was at the southeast corner. In 1987, a 47-floor office building called 7 World Trade Center was built north of the block. Beneath the World Trade Center complex was an underground shopping mall, which in turn had connections to various mass transit facilities including the New York City Subway system and the Port Authority's own PATH trains connecting Manhattan to New Jersey. Twin Towers at night seen from the Empire State Building in May 2001. On February 13, 1975, a three-alarm fire broke out on the 11th floor of the North Tower. Fire spread through the tower to the 9th and 14th floors by igniting the insulation of telephone cables in a utility shaft that ran vertically between floors. Areas at the furthest extent of the fire were extinguished almost immediately and the original fire was put out in a few hours. Most of the damage was concentrated on the 11th floor, fueled by cabinets filled with paper, alcohol-based fluid for office machines, and other office equipment. Fireproofing protected the steel and there was no structural damage to the tower. In addition to damage caused by the fire on the 9th - 14th floors, water from the extinguishing of the fires damaged a few floors below. At that time, the World Trade Center had no fire sprinkler systems. 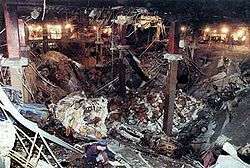 The first terrorist attack on the World Trade Center occurred on February 26, 1993, at 12:17 p.m. A Ryder truck filled with 1,500 pounds (680 kg) of explosives, planted by Ramzi Yousef, detonated in the underground garage of the North Tower. The blast opened a 100 foot (30 m) hole through five sublevels with the greatest damage occurring on levels B1 and B2 and significant structural damage on level B3. Six people were killed and 1,042 others were injured during escape attempts complicated by smoke infiltration from the base of the building up to the 93rd floor of both towers. Many people inside the North Tower were forced to walk down darkened stairwells that contained no emergency lighting, some taking two hours or more to reach safety. In 1974, French high wire acrobatic performer Philippe Petit walked between the towers on a tightrope, as shown in the documentary film Man on Wire (2008), based on Petit's book To Reach the Clouds: My High Wire Walk Between the Twin Towers (2002) (released in paperback with the title Man on Wire (2008)) and depicted in the feature film The Walk (2015). :219 Petit walked between the towers eight times on a steel cable. In 1977, Brooklyn toymaker George Willig scaled the exterior of the South Tower (2 WTC). The scene just after United Airlines Flight 175 hits the South Tower; a fireball rises high. On September 11, 2001, Islamist terrorists hijacked American Airlines Flight 11 and crashed it into the northern façade of the North Tower at 8:46:40 a.m., the aircraft striking between the 93rd and 99th floors. Seventeen minutes later, at 9:03:11 a.m., a second group crashed the similarly hijacked United Airlines Flight 175 into the southern facade of the South Tower, striking it between the 77th and 85th floors. The damage caused to the North Tower by Flight 11 destroyed any means of escape from above the impact zone, trapping 1,344 people. Flight 175 had a much more off-centered impact compared to Flight 11, and a single stairwell was left intact; however, only a few people managed to pass through it successfully before the tower collapsed. Although the South Tower was struck lower than the North Tower, thus affecting more floors, a smaller number, fewer than 700, were killed instantly or trapped. The 3 World Trade Center, a Marriott hotel, was destroyed during the collapse of the two towers. The three remaining buildings in the WTC plaza were extensively damaged by debris and later were demolished. The Deutsche Bank Building across Liberty Street from the World Trade Center complex was later condemned owing to the uninhabitable toxic conditions inside; it was deconstructed, with work completed in early 2011. The Borough of Manhattan Community College's Fiterman Hall at 30 West Broadway was also condemned owing to extensive damage in the attacks and is slated for deconstruction. 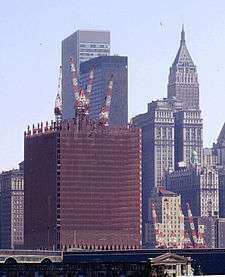 The first new building at the site was 7 WTC, which opened in May 2006. The memorial section of the National September 11 Memorial & Museum opened on September 11, 2011 and the museum opened in May 2014. 1 WTC opened on November 3, 2014; 4 WTC opened on November 13, 2013; and 3 WTC is under construction and expected to open in 2017. As of November 2013, according to an agreement made with Silverstein Properties Inc., the new 2 WTC will not be built to its full height until sufficient leasing is established to make the building financially viable. In Summer 2015, Silverstein Properties revealed plans for a redesigned Tower 2 with News Corp as the core tenant; the Bjarke Ingels-designed structure was expected to be finished by 2020. 5 WTC will be developed by the Port Authority of New York and New Jersey, but, as of February 2014, a schedule was not confirmed. ↑ "Ford recounts details of Sept. 11". Real Estate Weekly. BNET. February 27, 2002. Retrieved January 3, 2009. 1 2 "Trade Center Hit by 6-Floor Fire". The New York Times. February 14, 1975. Retrieved September 11, 2008. 1 2 Reppetto, Thomas (2007). Bringing Down the Mob: The War Against the American Mafia. Macmillan. p. 279. ISBN 0-8050-8659-5. 1 2 3 Cuozzo, Steve (January 30, 2001). "Larry Lusts for Twin Towers; Silverstein has an Eye on WTC's; Untapped Retail Potential". New York Post. 1 2 "Man's death from World Trade Center dust brings Ground Zero toll to 2,753". NY Daily News. Associated Press. June 18, 2011. Retrieved September 1, 2011. ↑ Miller, Bill (May 1, 2002). "Skyscraper Protection Might Not Be Feasible, Federal Engineers Say". Orlando Sentinel. Retrieved November 24, 2013. ↑ Iovine, Julie V. (September 27, 2001). "Designers Look Beyond Debris". The New York Times. Retrieved July 31, 2010. ↑ "The Last Steel Column". The New York Times. May 30, 2002. Retrieved July 31, 2010. ↑ "New World Trade Center climbs to 100 stories". Associated Press. April 2, 2012. 1 2 "World Trade Center Reopens for Business". Associated Press. Retrieved November 3, 2014. ↑ "CNN: Pieces of ship made in 1700s found at ground zero building site". Retrieved October 4, 2014. ↑ Hartman, Amir (2004). Ruthless Execution: What Business Leaders Do When Their Companies Hit the Wall. Financial Times Prentice Hall. ISBN 0-13-101884-1. , p. 167 "The electronic component distribution business started in the 1920s and 1930s, selling radio tubes on lower Manhattan's Cortland [sic] St...."
1 2 3 4 5 6 Glanz, James; Eric Lipton (2003). City in the Sky: The Rise and Fall of the World Trade Center. Times Books. ISBN 0-8050-7428-7. 1 2 Grutzner, Charles (December 29, 1961). "Port Unit Backs Linking of H&M and Other Lines". The New York Times. 1 2 Ingraham, Joseph C. (March 29, 1965). "Port Agency Buys Downtown Tract". The New York Times. 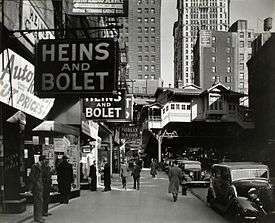 ↑ "'Radio Row:' The neighborhood before the World Trade Center". National Public Radio. June 3, 2002. Retrieved October 1, 2006. 1 2 Huxtable, Ada Louise (January 19, 1964). "A New Era Heralded". The New York Times. 1 2 Huxtable, Ada Louise (January 26, 1964). "Biggest Buildings Herald New Era". The New York Times. 1 2 Pekala, Nancy (November 1, 2001). "Profile of a lost landmark; World Trade Center". Journal of Property Management. 1 2 Huxtable, Ada Louise (May 29, 1966). "Who's Afraid of the Big Bad Buildings". The New York Times. ↑ "New York: A Documentary Film – The Center of the World (Construction Footage)". Port Authority / PBS. Retrieved May 16, 2007. ↑ Federal Emergency Management Agency (May 2002). "Chapter 1". World Trade Center Building Performance Study. ISBN 0-16-067389-5. Archived from the original on November 29, 2010. Retrieved June 9, 2011. ↑ Iglauer, Edith (November 4, 1972). "The Biggest Foundation". The New Yorker. Archived from the original on December 18, 2001. 1 2 3 "Timeline: World Trade Center chronology". PBS – American Experience. Retrieved May 15, 2007. ↑ Nobel, Philip (2005). Sixteen Acres: Architecture and the Outrageous Struggle for the Future of Ground Zero. Macmillan. p. 54. ISBN 0-8050-8002-3. ↑ Eric Jaffe (September 12, 2012). "The World Trade Center's Rocky Real Estate History". The Atlantic Cities. Atlantic Media Company. Retrieved September 11, 2012. ↑ Geist, William (February 27, 1985). "About New York: 39 years observing the observers". nytimes.com. New York Times. Retrieved September 23, 2014. ↑ Mumford, Lewis (1970). The Pentagon of Power. Harcourt Brace Jovanovich. p. 342. ISBN 0-15-163974-4. ↑ Dunlap, David W (March 25, 2004). "Girding Against Return of the Windy City in Manhattan". The New York Times. ↑ "World Trade Center Plaza Reopens with Summer-long Performing Arts Festival". Port Authority of New York and New Jersey. June 9, 1999. Archived from the original on December 28, 2008. ↑ National Construction Safety Team (September 2005). "Chapter 1". Final Report on the Collapse of the World Trade Center Towers (PDF). NIST. pp. 5–6. ↑ Taylor, R. E. (December 1966). "Computers and the Design of the World Trade Center". ASCE, Structural Division. 92 (ST–6): 75–91. ↑ "The World Trade Center: Statistics and History". 1 2 3 Mcdowell, Edwin (April 11, 1997). "At Trade Center Deck, Views Are Lofty, as Are the Prices". The New York Times. Retrieved September 12, 2009. ↑ "World's tallest building opens in Dubai". BBC News. January 4, 2010. Retrieved January 4, 2010. 1 2 McDowell, Edwin (April 11, 1997). "At Trade Center Deck, Views Are Lofty, as Are the Prices". The New York Times. Retrieved November 21, 2008. ↑ Adams, Arthur G. (1996). The Hudson River Guidebook. Fordham University Press. p. 87. ISBN 0-8232-1679-9. 1 2 Zraly, Kevin (2006). Windows on the World Complete Wine Course. Sterling Publishing Company. p. 260. ISBN 1-4027-2639-2. 1 2 Grimes, William (September 19, 2001). "Windows That Rose So Close To the Sun". The New York Times. ↑ "The Mall at the World Trade Center; New York, New York - Labelscar". Labelscar: The Retail History Blog. Retrieved October 4, 2014. ↑ Rediff.com. Reuters, November 17, 2001: Buried WTC gold returns to futures trade. Retrieved December 1, 2008. ↑ Johnston, David (February 9, 1995). "Fugitive in Trade Center Blast Is Caught and Returned to U.S.". The New York Times. Retrieved November 20, 2008. ↑ Hays, Tom & Larry Neumeister (May 25, 1994). "In Sentencing Bombers, Judge Takes Hard Line". Seattle Times / AP. Retrieved November 20, 2008. ↑ Ramabhushanam, Ennala & Marjorie Lynch (1994). "Structural Assessment of Bomb Damage for World Trade Center". Journal of Performance of Constructed Facilities. 8 (4): 229–242. doi:10.1061/(ASCE)0887-3828(1994)8:4(229). ↑ Petit, Philippe (2002). To Reach the Clouds: My High Wire Walk Between the Twin Towers. North Point Press. ↑ Petit, Philippe. Man on Wire. Skyhorse Publishing. ↑ "Skyscrapers. – Goodwin, Dan "Spider Dan" World Trade Center climb (1983), p 169". National Geographic magazine. February 1989. Retrieved January 30, 2011. ↑ "Skyscraper Defense". Retrieved July 4, 2011. ↑ "The 9/11 Commission Report" (PDF). National Commission on Terrorist Attacks Upon the United States. July 27, 2004. Retrieved September 29, 2015. ↑ Dwyer, Jim; Lipton, Eric; et al. (May 26, 2002). "102 Minutes: Last Words at the Trade Center; Fighting to Live as the Towers Die". The New York Times. Archived from the original on October 10, 2008. Retrieved May 23, 2008. 1 2 "FEMA 403 -World Trade Center Building Performance Study, Chapter. 5, section 5.5.4" (PDF). Retrieved January 30, 2011. ↑ "Final Report on the Collapse of World Trade Center Building 7 – Draft for Public Comment" (PDF). NIST. August 2008. pp. xxxii. ↑ "World Trade Center Building Performance Study". FEMA. May 2002. Archived from the original on April 30, 2011. Retrieved June 9, 2011. 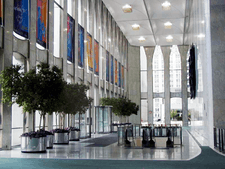 ↑ "World Trade Center Building Performance Study – Bankers Trust Building" (PDF). FEMA. May 2002. Retrieved July 12, 2007. ↑ "Fiterman Hall – Project Updates". Lower Manhattan Construction Command Center. Archived from the original on December 1, 2008. Retrieved November 19, 2008. ↑ Averill, Jason D.; et al. (2005). "Occupant Behavior, Egress, and Emergency Communications". Final Reports of the Federal Building and Fire Investigation of the World Trade Center Disaster (PDF). National Institute of Standards and Technology (NIST). ↑ "Official 9/11 Death Toll Climbs By One". CBS News. Associated Press. July 10, 2008. Retrieved August 29, 2010. ↑ "Cantor rebuilds after 9/11 losses". BBC News. London. September 4, 2006. Retrieved May 20, 2008. ↑ Grady, Denise; Revkin, Andrew C. (September 10, 2002). "Lung Ailments May Force 500 Firefighters Off Job". The New York Times. Retrieved May 23, 2008. ↑ "Post-9/11 report recommends police, fire response changes". USA Today. Washington DC. Associated Press. August 19, 2002. Retrieved May 23, 2008. ↑ "Police back on day-to-day beat after 9/11 nightmare". CNN. July 21, 2002. Archived from the original on May 17, 2008. Retrieved May 23, 2008. ↑ Lemre, Jonathan (August 24, 2011). "Remains of WTC worker Ernest James, 40, ID'd ten years after 9/11". New York Daily News. Retrieved August 25, 2011. ↑ Denerstein, Robert (August 4, 2006). "Terror in close-up". Rocky Mountain News. Denver, CO. Retrieved November 19, 2008. ↑ Pérez-Peña, Richard (November 3, 2001). "A NATION CHALLENGED: DOWNTOWN; State Plans Rebuilding Agency, Perhaps Led by Giuliani". The New York Times. Retrieved July 31, 2010. ↑ McGuigan, Cathleen (November 12, 2001). "Up From The Ashes". Newsweek. ↑ David W. Dunlap (June 12, 2012). "1 World Trade Center Is a Growing Presence, and a Changed One". New York Times. Retrieved December 9, 2012. ↑ NY1 News (September 12, 2011). "Public Gets First Glimpse Of 9/11 Memorial". Retrieved September 12, 2011. ↑ "Blocking 3 World Trade Center deal a bad idea". New York Post. March 17, 2014. Retrieved June 9, 2014. ↑ Porter, Dave (June 25, 2014). "Deal Reached to Finish 3 World Trade Center Tower". Associated Press. Retrieved August 2, 2014. ↑ David M. Levitt (November 12, 2013). "NYC's World Trade Tower Opens 40% Empty in Revival". Bloomberg. Retrieved February 22, 2014. ↑ "2 World Trade Center Office Space -- World Trade Center". ↑ "5 World Trade Center". World Trade Center. Silverstein Properties, Inc. 2014. Retrieved February 22, 2014. Cudahy, Brian J. (2002). Rails Under the Mighty Hudson (2nd ed.). New York: Fordham University Press. ISBN 0-8232-2190-3. OCLC 48376141. Glanz, James & Eric Lipton (2003). City in the Sky. Times Books. ISBN 0-8050-7428-7.